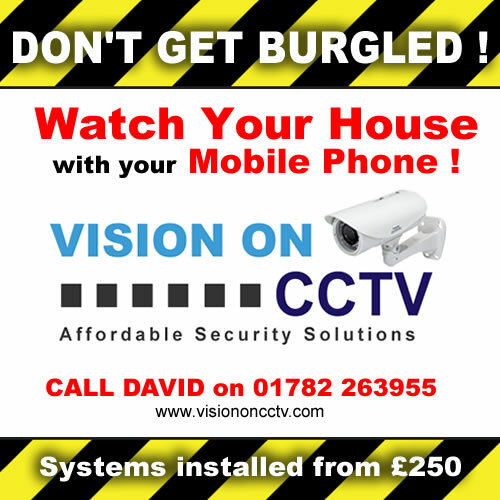 Watch Your House From Your Mobile Phone- Remote CCTV Systems in Stoke on Trent for £250! Yes our new remote four camera cctv system allows you to watch your house or business property from almost any location using your mobile phone, tablet or laptop. This will give you piece of mind when you are away and also records event 24/7. Whatever you do in 2016 don’t get burgled, we can fully alarm your home or business from just £250 complete with digital panel,3 pir sensors, panic button and external bell housing,4 camera cctv systems fully installed for just £475 or 8 camera systems from just £795, view them on your phone or laptop anywhere in the world with no monthly monitoring costs,installations,repairs or updates.